INDUSTRY.co.id - Cikarang - PT Jababeka Longlife City held an exclusive "Music for Healing with Maya Hasan" exclusive event held at Senior Living D'Khayangan, Jababeka City, Cikarang, Friday (16/6). The event was attended by Director of PT Jababeka Longlife City Marlin Marpaung, Advisor of The President Post Ali Basyah Suryo, Budiawan Eka Budianta and 30 participants of Music for Healing from various circles. In his speech Marlin expressed his gratitude to all the invited guests and participants who have attended the event. He said, "We talk a lot about Maya Hasan because she also has a passion in the field of healing." "But according to her field of expertise, through harp music," he added. 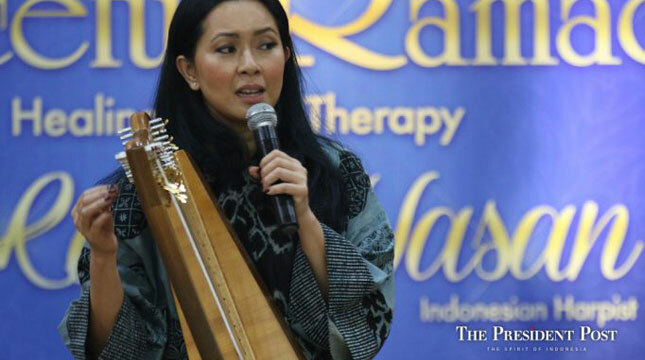 Marlin also said that harp is a formal education in America also in Indonesia a few years ago in the field of entertainment. "This is exactly what Maya Hasan and I want to develop in the future," said Marlin. On the occasion, Maya said that several years ago, she still has not found whether the healing is in the field that she lived for. she said "Finally I found that the harp had the perfect wave, the waves were always soothing." "And that perfect wave can be absorbed directly by our bodies," she added. Maya also provides an opportunity for the participants to feel the vibration that comes out of its harp. The participants seemed to really enjoy the exclusive night, Ms. Ina as one of the participants conveyed her pleasure, "Maya Hasan harp is quite soothing and feels good to sleep." Maya also sang several national anthems to boost the enthusiasm of the participants, such as "Garuda Pancasila" and "Inside You". The event closed with a photo together and a casual discussion, some participants staying at the 3 floor apartment Senior Living D'Khayangan.